FocusTrack, the production lighting documentation system, will be at the USITT Stage Expo in Cincinnati this week; visitors to stand #81 will be the first to see the new FocusTrack 2.00, which adds compatibility with ETC Eos and MA grandMA consoles. In the more than three years since its first introduction, FocusTrack has been put to use on countless shows, allowing lighting designers and their teams to precisely document the show lighting - including focus of conventional and moving lights, cue looks, rig data and more - to allow them to maintain the look over a long run, bring the show back into rep, re-focus it on tour or re-create it elsewhere in the world. FocusTrack is currently in use on shows including Billy Elliot in London, New York and Australia, Mary Poppins in New York and on tour, Frost/Nixon and The Wizard of Oz touring the US, and Miss Saigon around the world, and at producing companies including English National Opera and the National Theatre. From the beginning, a key driving principle of FocusTrack has been to reduce the amount of manual data handling and re-keying that lighting staff have to do. 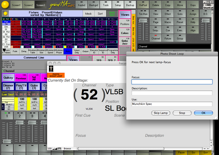 FocusTrack has always been able to automatically process information from Strand 500-series consoles to generate lists of which lights are used where and in which cues, which colours and gobos are used and to give an accurate copy of the console patch and cue sheet. When photographing photographs, FocusTrack has also been able to control the console, bringing up lights in the right place quickly and efficiently. 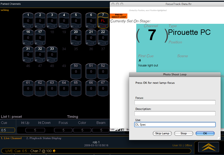 In FocusTrack 2.000, this functionality is dramatically extended to include ETC’s popular Eos and Ion consoles, and the successful grandMA console from MA Lighting. This will open the functionality of FocusTrack up to a much wider range of console users, giving more people the chance to reduce the amount of time they spend manually trawling through their showfiles in off-line editors to find out what’s used. Early test versions of the Eos-compatible FocusTrack saw service on Young Frankenstein in New York, while grandMA compatibility has been proven on the UK tour of Mary Poppins and US tour of The Wizard of Oz. FocusTrack 2.00 comes in one version that can be switched freely between use with Strand 500-, Eos and grandMA consoles; existing users can move to FocusTrack 2.00 at no additional cost. In addition to new consoles, FocusTrack 2.00 offers a wealth of new functions, including the ability to ‘spot the difference’ between the console patch and a Lightwright file, so simplifying the task of making sure everything is up to date. Further information about FocusTrack 2.00 can be found here - or by visiting stand #81 at the USITT Conference and Stage Expo in Cincinnati from March 18-21, ww2.usitt.org. FocusTrack 2.00 will be available for download at the beginning of next week.